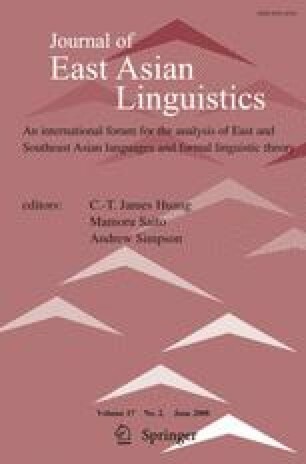 This article concerns the “topography” of the Left Periphery, in particular, the syntactic distribution of how-questions across languages and their corresponding semantic interpretations. Causal wh and reason wh are analyzed as sentential operators in the left periphery, which scope over the entire IP and take the corresponding event/state as their complements. By contrast, manner and instrumental wh’s are both analyzed as vP-modifiers, which translate into restrictive predicates of the underlying event argument associated with the peripheral area of vP. These wh-expressions differ dramatically with respect to their behavior towards locality principles. On the one hand, only instrumental wh, but not manner wh, may escape from strong island effects and weak intervention effects. On the other, they both observe strong intervention effects, triggered by negation and A-not-A questions. It is suggested that this apparent paradox can be solved by a generalized version of Relativized Minimality proposed in Rizzi (Structures and beyond. The cartography of syntactic structures. Oxford University Press, New York, 2004).